Abstract: Background: Present world is badly affected by AIDS. The chief causative agent for AIDS is HIV. The essential milk proteins; bovine lactoferrin (bLF) and human lactoferrin (hLF) are known to obstruct the interaction between HIV gp120 and DC-SIGN protein after sexual transmission. Earlier several research studies have been performed to document the active participation of gp120 protein and lactoferrins, but the molecular-level analysis for lactoferrins (bLF and hLF) and gp120 interaction was never explored. 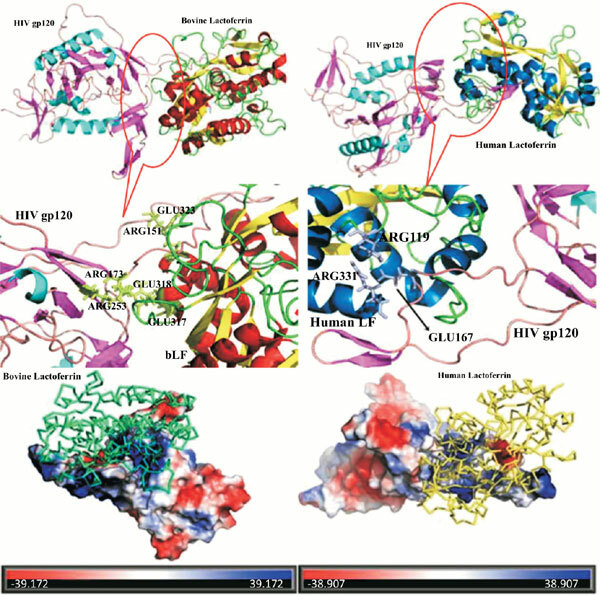 Methodology: Firstly, three essential proteins (hLF, bLF and gp120) were analyzed and demonstrated for their experimentally validated x-ray crystallographic structures. The bLF-gp120 and hLF-gp120 protein complexes were formed. After energy minimization and simulation, the residual participation was observed. Additionally, thermodynamic properties and stability of the proteins were evaluated for the individual complexes. Results, Discussion and Conclusion: Residual interactions showed the predominant ionic-ionic interactions to be double for bLF-gp120 complex than hLF-gp120 complex. 4 ionic-ionic interactions by Glu residues from bLF protein were strong enough to accommodate gp120 protein into the pocket formed in bLF protein. Net area for solvent accessibility and electrostatic surface potential were observed to satisfy better interaction with bLF. Fascinatingly, increased percentage of β-sheets in gp120 after interacting with bLF depicted that gp120 adopted a steadier conformation, whereas; upon interaction with hLF, flexibility of gp120 got increased with increased percentage of residues forming coils. From ΔG evaluations, hLF protein was observed to interact less spontaneously with gp120 protein than bLF protein, thereby allowing the flexibility in the gp120 protein to interact with other host cells in human. Altogether, it affirms gp120 to have weaker interaction with hLF. Therefore, bLF acts as a stronger proficient HIV inhibitor. Thus, this probe provides a coherent outlook for investigating into the mutational impacts on bLF and hLF protein and further interaction with gp120. Keywords: AIDS, biostatistics, lactoferrins, residual contribution, simulation, thermodynamics. Keywords:AIDS, biostatistics, lactoferrins, residual contribution, simulation, thermodynamics. Abstract:Abstract: Background: Present world is badly affected by AIDS. The chief causative agent for AIDS is HIV. The essential milk proteins; bovine lactoferrin (bLF) and human lactoferrin (hLF) are known to obstruct the interaction between HIV gp120 and DC-SIGN protein after sexual transmission. Earlier several research studies have been performed to document the active participation of gp120 protein and lactoferrins, but the molecular-level analysis for lactoferrins (bLF and hLF) and gp120 interaction was never explored.